mishti doi is a classic bengali sweet made with milk, curd culture and jaggery or sugar. 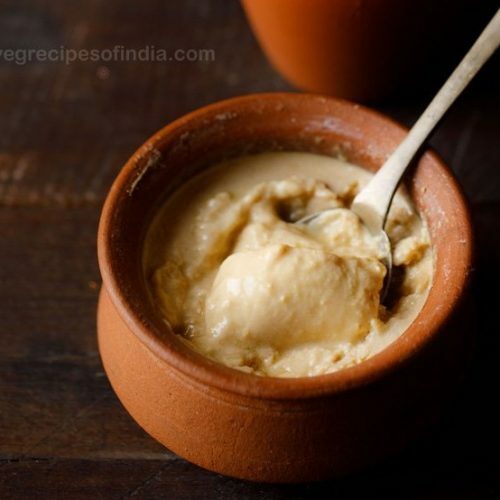 the jaggery used traditionally to make mishti doi is palm jaggery. in bengali language 'mishti' means sweet and 'doi' is curd. in hindi language mishti doi can be called as meetha dahi. take 1 litre full fat milk in a heavy kadai or pan. keep flame to low or medium-low and begin to heat milk. stir occasionally when the milk is getting heated. let the milk come to a boil. then continue to simmer the milk on a low to medium-low flame stirring often. scrape the dried milk solids from the sides and add to the simmering milk. simmer milk till it reduces to ⅓ or ½ of its original volume. keep the kadai down and let the milk cool for about 8 to 9 minutes. meanwhile finely chop or grate 175 to 180 grams palm jaggery. you will need ¾ cup finely chopped palm jaggery. after 8 or 9 minutes, add the chopped palm jaggery. when adding jaggery, the temperature of milk can be 60 to 65 degrees celsius. mix very well till all the jaggery is dissolved. add ½ teaspoon cardamom powder. mix well and let the milk become warm. check the temperature of milk. it should be warm – meaning if you dip your finger in the milk, your finger should feel comfortably warm but not hot. if you have a cooking thermometer, you can check the temperature. it should be between 40 to 44 degrees celsius. now add 2 tablespoons curd. with a whisk mix very well. the curd should dissolve in the milk. if you want you can even beat the curd before you add. now pour the doi mixture in earthen or terracotta bowls or earthen handi. cover with a lid or seal with aluminium foil. keep in a warm place for the mishti doi to set. mishti doi takes longer to set than curd. the timing will also vary with the temperature in your city. so you can keep for 9 to 24 hours. when the mishti doi is set, then refrigerate. serve mishti doi with your meals or as a dessert.